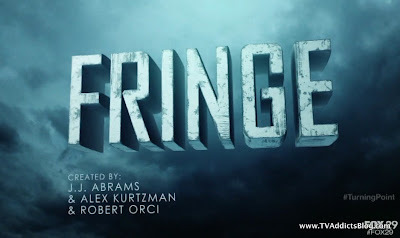 Hello Fringe fanatics! Welcome back as we count down to the end of the series. Last night, we got our infamous "odd man out" episode of the season. 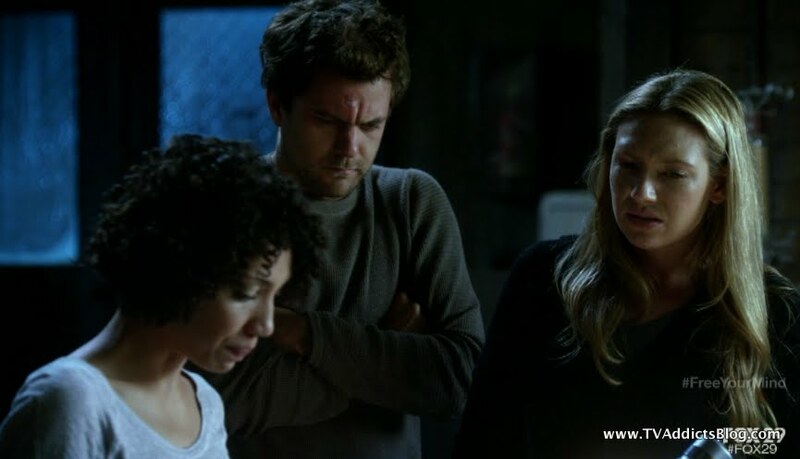 If this were a full season of Fringe, it would have been episode 19, but since this is an abbreviated final season we have to settle for episode 9. 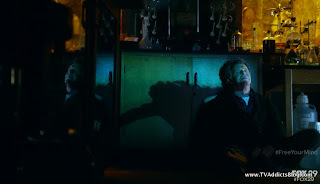 A couple of the episode had dealt with Walter in an induced state and this episode was no different! But, it was a nice device to allow us to explore the inner workings of Walter's complex mind and the internal conflict he has probably been working through for some time. But, the most important thing that happened in the episode for me? They addressed the timeline discrepancies!! And anyone who has read my recaps all season and comments know that this was a big sticking point for me. I'm not saying they resolved anything with it, but at least they addressed the issue was still there. And we'll dive more into that in the recap/analysis below. I'll put the disclaimer out there, I was pretty tired watching the episode last night as I had just come back from a 3 hour Hobbit viewing. (In my defense, Fringe usually would be off the air by this point in December, but Fox is totally burning off episodes as the ratings do not help them at all) So, if I miss something go easy on me. And for the fact that I fading to sleep during some moments of the show, I'm going to assume that the episode was fantastic from start to finish and give it my trademark WOW rating! So, let's dive into the recap and see what I can come up with and more importantly, what everyone else can add to the conversation! The episode was largely about tracking down Donald when the radio transmitter they picked up in a pocket universe suddenly started transmitting. Of course, Walter had just dropped acid not knowing that something important was about to go down. 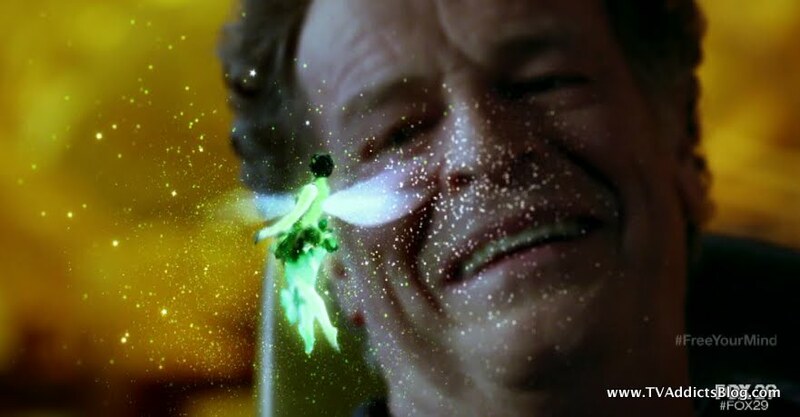 Throughout the episode we saw some of the effects of the LSD on Walter as he envisioned a green fairy flying around him and rooting him on. 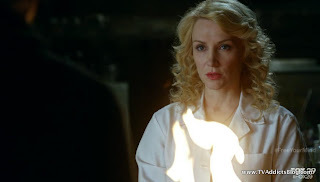 But, mainly his guide through his tripping session was Dr. Carol Warren, Walter's old lab assistant who was killed in a lab fire that ultimately led Walter to being locked up in St. Claire's mental institution all of those years ago. Carol pretty much represented the "dark side" of Walter's brain leading him in the direction of his former god-like pursuits in science. She led Walter to find his hidden book of his old inventions and ideas that led him to become the man that he regretted. We also had appearances from "young Nina" who pretty much represented Walter's good side. She begged Walter to avoid these temptations from Carol. 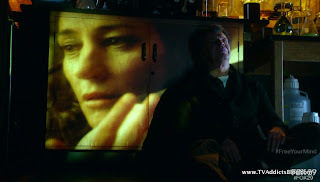 Walter deals with these hallucinations throughout the episode and it culminates in him remembering some of the awful things he had done and one of the big conversations that he and Carol had. (We first saw the conversation in the season 2 episode "Peter". I can't tell if there was more added to the conversation for this season or not. But maybe on rewatches I'll know!) In the end, we see Walter burn his old book of inventions in attempt to purge the former him. But, Dr. Warren told him that it's too late. Now, he has seen the book he has remembered his old ways and there is no way to undo that. We are left with a shot of Walter staring at his darker self who replaced Carol. And we're left wondering what Walter we're going to see next week. The search for Donald took the crew on an interesting ride. 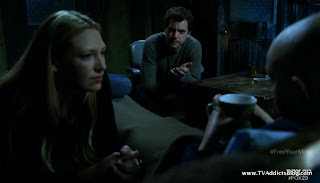 Peter and Olivia recruited Anil to track down the signal which took them into the woods of Connecticut. The saw the remains of a 15 year old fight with Observers and Loyalists and one deceased Sam Weiss! (HUH?! We'll get to that later) They find out that the signal's source was not there but a relay to extend the signal. They eventually track the signal to an island where apparently the Emerald City is! (in Walter's induced mind at least) There is a fight between the Fringees and the Loyalists guarding the docks. But, our team manages to get a boat and get across the river. They follow the signal to a house where we find Carol and Richard (2 Carol in one episode? Must be Christmas time. Insert rim shot and eye rolls please!) Long story short, Carol and Richard were friends of the resistance for years and Donald asked them to watch over the boy observer (empath). He has been with them for 20 years and hasn't aged a day. They call him Michael. They were asked to turn the transmitter on every 5 days. They knew this day would happen eventually where they'd have to hand over Michael to a scientist from Boston. There are also rumors of Donald's death, but let's be real here. We're going to meet Donald and he has to be someone we know. (At this point, money has to be on William Bell, but we'll see.) Peter, Olivia, Walter and Astrid take Michael back to Boston. He will be a key figure in the Observer takedown. He has been important since season 1 and we're going to find out why soon. I guess we all have to go back and watch that season 1 episode Inner Child to search for clues! Okay, so that was the episode, let's analyze more below. Glyph Code: GUILT - I'd say so. Perfect summation of Walter's feelings in the episode. Thanks Fringepedia as always for the screenshot! Observer Spotted: We spotted Dead observers enroute to finding Donald. Food of the Week: Hmmm, I think we skipped this again this episode. But there were definitely drugs! There was Hot Cocoa though, but that was for Michael. I think we have to give a nod to the Terry Gilliam inspired (or maybe drawn?) cartoon that Walter goes through to figure out the password "Black Umbrella". Totally a Monty Python moment. I can't remember any good quotes from the episode but come on, Walter was tripping! Timeline Stuff - Finally! The timeline is addressed. Olivia mentions that only Peter and her remember Sam Weiss from "a different timeline". Of course, this introduces its own issues. Sam Weiss was the keeper of knowledge on the machine. And the machine still existed in the rebooted timeline. So, confusion still exists around how they think that machine bridged the 2 universes with no existence of Peter or knowledge of Sam Weiss. Crazy. And then Michael at the end remembered Olivia and Peter! But how could he remember them since he knew them in another timeline? (Peter asks this directly) Olivia thinks that observers probably experience time differently and maybe he does too. Regardless, this gives me hope that they might make sense of all of the timeline discrepancy stuff by the end. It might all play into a larger theme. Here's hoping! Donald - We still have yet to meet Donald. As I mentioned above, he is now believed to be dead. 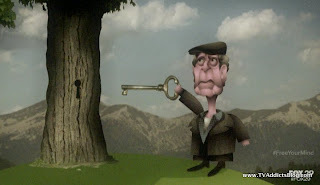 But, we know that William Bell was ambered with Walter, Peter and Astrid. This could have led to people believing he died since he vanished. Perhaps William Bell did have a change of heart in this rebooted timeline and was in fact trying to help the resistance. I can't think of many other people it could be. Of course, there is this "DOVE" that a loyalist was interrogated about this season that Broyles observed. I had forgotten about it until this past week. I guess we need to find out who The Dove is too. It could be that The Dove = Donald = Bell. Or there could be more to it. We'll see! The Boy - So, Michael. Who is he? Why is he important? We're past the Peter = September theories, but an even older theory was that this boy might be September. We haven't seen September all season, and there has to be a reason for that! I'm not saying he's definitely September, but I'm not ruling it out. The Boy certainly holds some key to the series. It would be interesting to know if they had always intended that from the beginning, but doesn't really matter if they didn't! Peter/Olivia stuff - Peter and Olivia seem to be on the mend. Peter was shocked by Olivia's endless understanding. He said that he didn't deserve her. He did the one thing he promised he'd never do again, leave her. But, she was still there for him. We even got their first big kiss of the season. Of course, there is also concern over some headaches that Peter has been getting since removing the tech. It could be just after effects that will wear off, but on this show it would seem to be a clue to more. We'll see! Walter - We were reminded as we've been reminded all season to the trajectory that Walter was on with his brain fully intact. The quotes were repeated at the end from his argument with Carol. "There's only room for one God in this lab and it's not yours!" "I have become death destroyer of worlds." - Oppenheimer. Walter and Nina in the present (future) day have agreed that once this conflict is resolved, she will once again remove the pieces of his brain that bring out his dark side. Peter is highly against this idea as it seems too dangerous. This surely seems to be hinting at some kind of tragic end for our beloved scientist. Of course, I thought if it did happen it would be in a more sacrificial way for the benefit of his "family". And that's all I got this week folks! I know it may be short, but come on, it's the holidays! On the bright side, it's probably a lot longer than the one you'll be getting next week. Why? Because I don't think I'm going to have time for a recap next week! 12/21 is so close to Christmas and I'll be already traveling to see family. But, I'll leave a discussion post up for us to check in whenever we actually watch it. And we'll resume our Fringe dissections in January for the final 2 weeks of the show. (The final 2 episodes will air on the same night on January 18th.) But, we have plenty to discuss this week so let's get to it. Hope you enjoyed my ramblings and I'll see you as soon as possible! Happy Holidays! I don't think you missed much Mike the episode was pretty straight forward (at least on the surface). I'd agree with you on Bell being Donald except for the fact that you mentioned regarding him being ambered with the rest of the team. I'm not sure he isn't Donald though because we really don't know the time line of how things went down before they ambered themselves. Yes, we have had confirmation of a different time line once again. 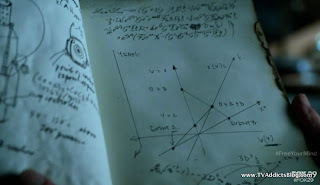 I really doubt that all those dots can be connected in the time we have left unless it's just going to spill out in one discussion between characters. I still want some mention of the machine which, as far as we know, is/was in both timelines. I also immediately thought "Monty Python" during that animated sequence. Also reminded me a little of The Beatles' "Yellow Submarine" movie. 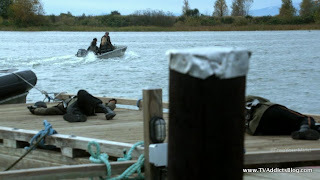 One thing I did wonder, why did they take the broken down boat when they could have taken the loyalist's boat (they were all dead right?). At least we can check the radio of the list, it has served it's purpose. I can't think of anything you missed but if I do I will post a follow up. Yeah, Bell and Walter were certainly in a heated argument before the ambering process. But, that wouldn't necessarily prevent him from being Donald. Walter can't remember who Donald is, so they could have been working together and then Bell did something to make Walter think he couldn't trust him anymore. I would like to see Bell as an ally in the end of all of this. But, we'll see! Fringe is pretty good at explaining things in a discussion between characters, so if one person came in and shined a light on the whole timeline discrepency stuff that would be awesome. But, it's not really essential, and I know that. The Machine definitely existed in both timelines because we saw them shut it down at the end of season 4. 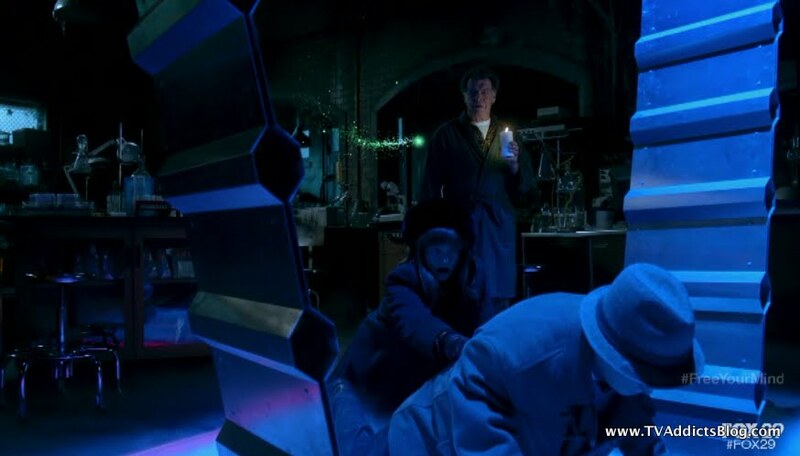 The origin of the machine would still be the same as it was one future timeline's version of Peter, Walter, Astrid and Ella that sent it back through the wormhole to ripple through all subsequent timelines. Hmmm....so I guess it always would have been designed for Peter to use even if he didn't exist in the current timeline. Because it was designed for that OTHER timeline's Peter. lol (make sense?) I think I just talked myself into this making sense even though it's very confusing. The fact that the worlds were bridged is a result of what Peter did, which caused him to disappear. But, what never added up to me is that everyone realized the worlds were bridged but never questioned who made that happen. And, yes that's probably a convenience for the writers choosing not to explain it. Good call on the Yellow Submarine movie. Didn't think of that one. As for the broken down boat. Good question. Were they all dead? I can't remember if they snuck away or something. But, I'll just go with that one. lol And touche' on the radio. So how was Hobbit? Heard the visuals due to the new film speed was a love it/hate it type of thing. 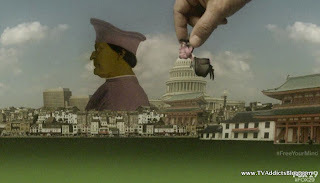 I've seen the promos - they looked weird - almost like animated or CGI ? Def felt the Monty Python thing - cracked me up. Loved the green fairy, and the young Nina and old lab asst playing angel/devil on his shoulder. Boy was I shocked (happily) that they brought up Sam Weiss again. I was a little let down that they didn't do more with his character back in the day. I know lots of folks say Donald is Belle - but wouldn't it be awesome if it's they guy who partnered with Olivia and went to live with Fauxlivia in the other universe?? Can't think of his name right now though . Inheritance seems to be a big theme. Tree guy got the records keeping gig from his dad, now his son will take it over. The 'sensitive' last week inherited holding the truck from her mom, Sam Weiss now brought up and we know his knowledge passed down thru generations. Technically Etta becoming a rebel was passed down from Olivia and Peter and Grandpa Walter, and now Etta's rebellion has been passed back to Olivia and Peter. 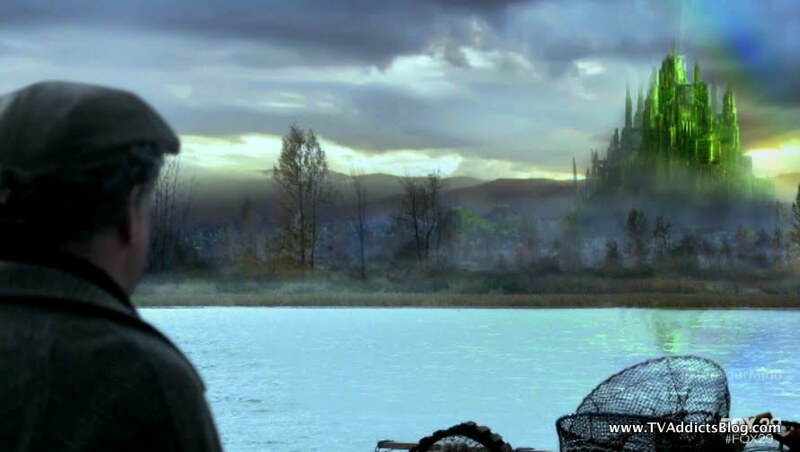 Did any one else think that they would end up at Reiden lake ?? Seeing himself in the end and that asst saying you've been him longer than you - very creepy. 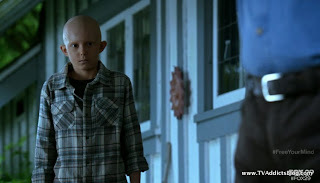 I'm fearing for Walter in the end of the show now. The Hobbit - I thought it was really good! The High Frame Rate (not speed, just more frames per second) was a mixed bag for me. I hate the crazy simulated frame rate effect you can put on HDTVs, I always turn it off. So, when I heard Jackson was fiming at 48 Frames per second instead of the standard 24, I was nervous. But you don't HAVE to see it in HFR, only if you're seeing 3D or IMAX 3D, which we did to see the 9 minute preview of Star Trek (looks awesome!). Anyway, I liked the HFR in some cases and in others I thought it was just too BBC/Soap Opera...usually when they were in close quarters like Bag End. But the movie itself, I couldn't have imagined it being any better. Sure, you can tell where he probably added stuff from Hobbit/LOTR Appendices but it's all about the rise of Sauron which will blend it nicely into the LOTR Trilogy. I had read like the first couple chapters of The Hobbit after Fellowship came out in theaters, and it totally reminded me of reading it. lol Never finished the book which I'm sure is some kind of blasphemy or something! lol Maybe I'll go back and read it now. Of course, probably should read the LOTR books one of these days too! 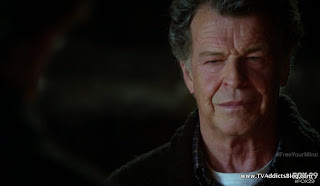 FRINGE: Yeah, i always expected more from Sam Weiss too. They really reduced his role in the grand scheme of things when we got to the season 3 finale. Before that, he seemed even more important to the series. So yeah...that's another good point. Lincoln Lee could be Donald which would be interesting since he's in the Red Verse now. Seth Gabel, the actor, was seen in Vancouver at the 100th episode/wrap up party so he may have come and did some Fringe work. But he was officially there filming for another Vancouver show, I think. Good point in the boat, makes enough sense to me! Hmm, didn't even consider Reiden lake in this episode. Maybe before the end of the series though?? Yeah, I made a similar comment in the recap. If ANYONE is expendable from the core 3, I always thought Walter would be the one to go in some sacrificial way. We'll see! They have 3 tech pieces now, so maybe they can all(3 main characters) go check out various possible futures. I'm not sure the Red universe exists any more. To me it's existence or lack of would be helpful in understanding the timelines. 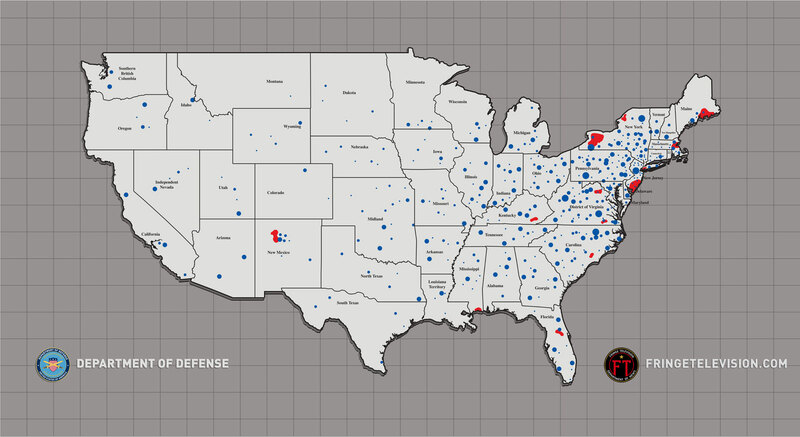 And info on the Red universe would give some understanding of what happened to the machine. I think they'll bring it all together without too much cheese--so to speak. But given what's happened so far this season I've more or less lost interest in trying to figure out how. Mostly just along for the ride now. 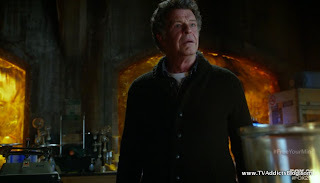 They have been bringing together a lot of assets to defeat the Observers so I kind of expect something similar to what the machine did in bridging the universes--that is a significant event involving timelines and/or universes. But, it could be something as simple as just disabling their tech. My memory is a little fuzzy, but I thought a reference was made about how Walter caused these problems by going to the Red universe to get Peter. If I recall properly and given his current set of problems along with the love theme I kind of suspect him sacrificing himself for those he loves. Thanks for the recaps and have a Merry Christmas! Thanks Richard! Merry Christmas to you as well and Happy Holidays to everyone! They do have 3 pieces of tech, but I still don't know if they'd risk using them. We saw what it did to Peter! They may be smarter than that. 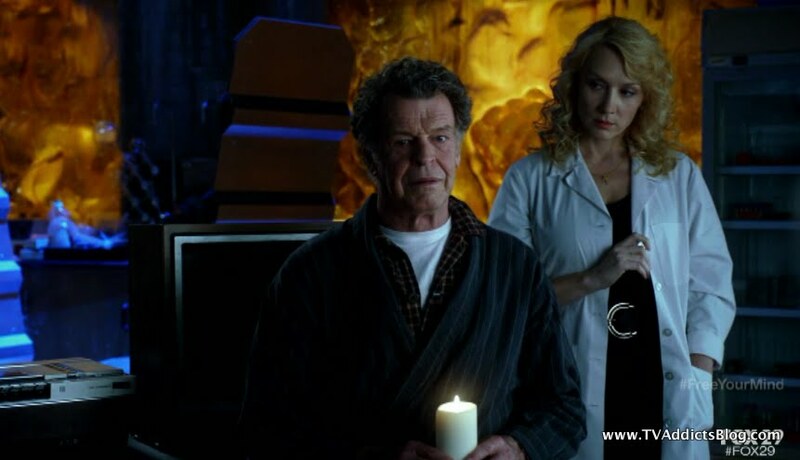 Of course, it may have something to do with the self-sacrifice that many of us think Walter may succumb to. Red Universe DEFINITELY still exists as far as we know. We learned at the end of season 3 that the 2 universes really can't exist without the other. Remember in that future vision in S3 the Blue verse was slowly being destroyed too because the Red Verse was destroyed all those years before. At the end of season 4, they simply shut down the bridge saying goodbye to our Red Verse adventures and giving that a sense of closure for the show. There's a chance it could still make a cameo in these final episodes though. So the Machine probably still exists too unless it was dismantled, destroyed or whatever. They simply shut it down at the end of season 4. Yeah, I'm not really trying to figure things out either. I have my guesses which I share every week, but I'm just happy the show is getting to close on its own terms. Yeah, I'm thinking along the lines of timeline altering too especially with the products they're assembling. A Boy Observer, the beacons, electromagnet, etc... But yes, it could be as simple as disabling tech. We'll see! Walter did cause the tears in the Red Verse by opening a door and crossing over to save Peter. So yes, he did cause many of the problems. I'm not so sure he had anything to do with the Observer Invasion though, well unless we learn something new about the origin of the observer tech or something like that and it's something Walter and Bellie conceived. lol But yes, I agree that I could totally see Walter making a sacrifice for his loved ones. No problem on the recaps! Wish I could do one this week too, but it's just not feasible! lol I'll try to post a discussion thread though. In case no one has time to go back and watch Season 1's Inner Child ep, this scene from it surely could support theories that Michael(Child Observer) = September. At the very least, there is a connection. I'm a little behind on the discussion, but I definitely feel Michael is September! I wasn't a big fan of the "tripping" segment, and I think you are correct in that fans would not like the whole "oh, it was just a dream" scenario. Hope that's not what's going on.